Today’s Senate Judiciary Committee hearing over Christine Blasey Ford’s allegations against Supreme Court nominee Brett Kavanaugh is still in progress, with the judge’s testimony set for later this afternoon. But it’s clear already that Republicans are paying a steep price for the starring role being played by committee chairman Chuck Grassley, who is acting as the perfect illustration of GOP Old White Male fecklessness in the presence of an alleged sexual-assault victim. The contrast between Grassley and ranking Democrat Dianne Feinstein, who is a couple of months older than he is, has been especially sharp. Yes, Grassley has provided a pro forma expression of sympathy for Ford’s situation, but Feinstein is visibly and emotionally connecting with her, and parrying Grassley’s complaints about her decision to protect Ford’s confidentiality with largely unanswered questions about his refusal to call other witnesses. 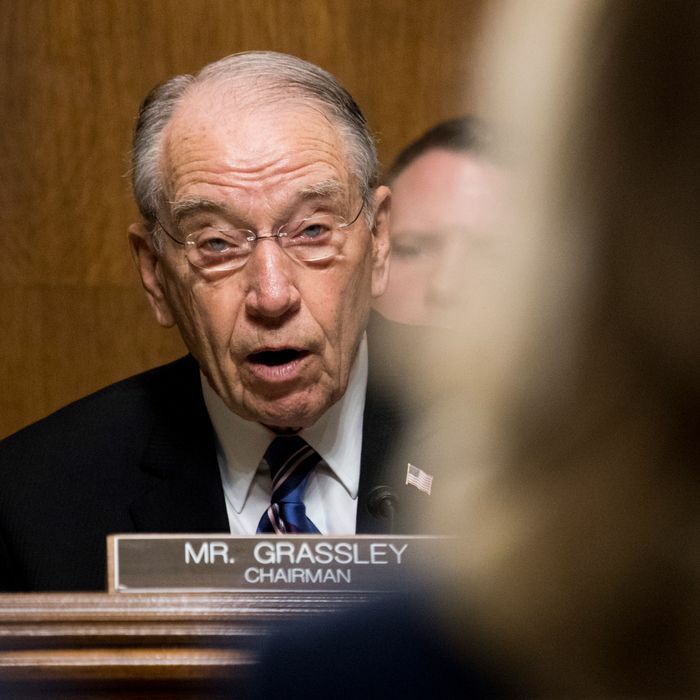 The high ground Grassley has given Democrats by his behavior at the hearing has been lifted even more by his disastrous decision to delegate Republican questioning to professional prosecutor Rachel Mitchell. Yes, Mitchell is a woman, with considerable experience in dealing with sexual-assault victims. But so far she has sounded like an interrogator tinkering around the edges of an unfamiliar witness’s story (which she is) at the beginning of a ten-day trial, not someone frittering away very limited time with pointless questions leading to multiple dead ends. Meanwhile, Grassley and his Republican colleagues sit in the room silently, appearing afraid to trust the impression they would make if they participated in their own hearing. Maybe Grassley will recover before Ford leaves the hearing, or in today’s later questioning of Kavanaugh. But at this point, in what is probably the highest-stake moment in his 38-year Senate career, he’s looking overmatched by circumstances and outgunned by his Democratic rivals. If Kavanaugh’s confirmation goes down, moreover, he and his committee will be back soon to go through this whole process again. That’s not good news for Republicans.